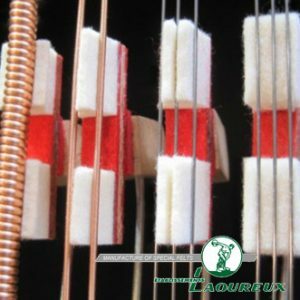 In the last 2 articles, we examined the hammers and strings, which are primarily responsible for the initial impact of piano tone. But tone without amplification will not be heard. If you’ve ever listened to an electric guitar that is not plugged in, the sound of the strings is very faint. That’s because they do not have natural amplification from the soundboard which magnifies the tone. This month, we’re not going to look at the soundboard, however but the intermediate piece that transfers the tone to the soundboard. The part responsible for this is called the bridge because it acts as a bridge between the strings (sound source) and the soundboard (amplifier). The bridge is one of the central pieces in piano manufacturing. In fact, it is one of the most significant signatures in piano making. Why? 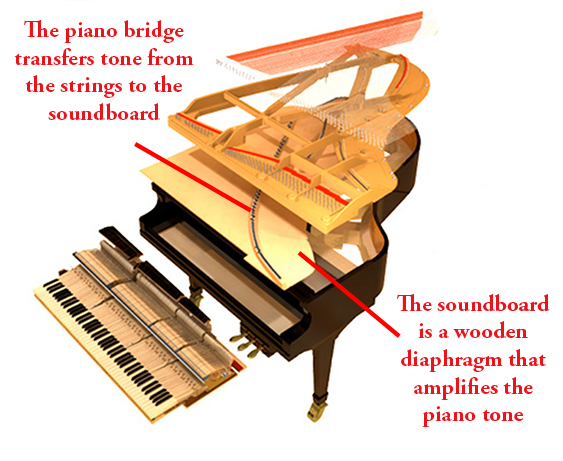 Because the bridge could be considered the ‘microphone’ of the piano. It takes sound waves from the strings and acts as a transducer, transforming wire vibration to audible sound waves. In truth, the bridge, soundboard and ribs act as a unit. They are inseparable. But today we’re going to briefly look at the bridge independently and how it differs from one maker to another. 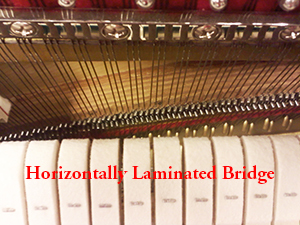 A piano bridge is a thin section made of wood that runs perpendicular to the strings. Pianos generally have 2 bridges; the short bridge for the lower bass section and the long bridge for the tenor and treble sections. The sizes vary from maker to maker but they run the width of the piano and average about 1½” wide and are about 1” tall in the treble and 2” tall in the bass. Piano strings have fixed points at either end and intersecting the strings are the bridges. What this means then is that the strings cross over the bridge and the bridge must endure a portion of the 20 tons of string tension (see explanation of string tension). 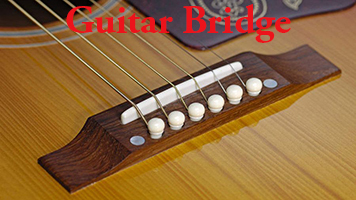 To ensure proper “pickup” of the vibration of the strings, bridge pins are commonly used to secure the strings in place. Doing research on what piano to buy, you may want to consider the impact of this significant yet often overlooked part of the piano. 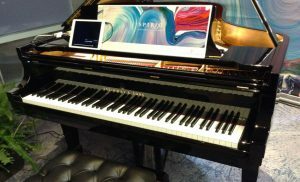 Although an article could almost be written on every aspect of the piano bridge, we are mainly going to examine differences and advantages commonly seen in piano manufacturing. Density is a key consideration for piano bridges. 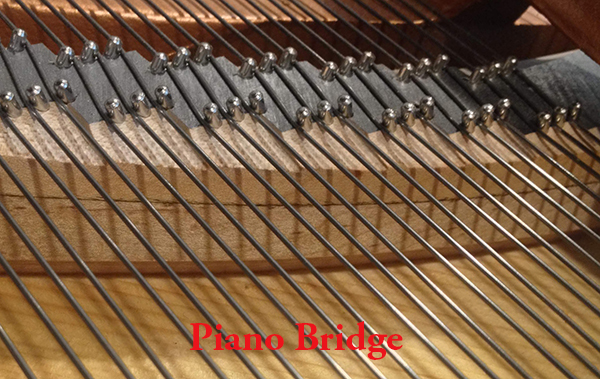 Too soft of wood and the 225 wires of the piano crossing over the bridge will crush the wood. There needs to be some measure of density to resist the down bearing of string tension. Subsequently, bridges are made of firm woods like beech or maple. The problem with density, however is that it is counter intuitive for sound transference. Denser materials are more difficult for sound to transfer through. So there’s this balance between density and transference. 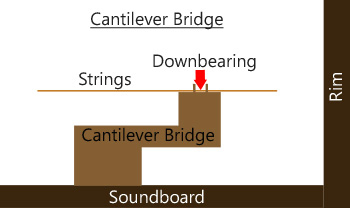 To transfer the sound effectively, manufacturers cut out areas of the bridge to reduce the mass and increase energy to the soundboard. Some manufacturers cut holes in the bridge while others shave off edges to maximize sound transference. These mass reduced bridges will enhance the energy to the soundboard and optimize projection, volume and sustain. Solid: Originally, bridges were made of one solid piece of wood. The advantage is that the sound can transfer directly through it. Cons: Finding a uniform solid piece of wood to cut an irregular shape consistently is challenging. With thousands of pounds of pressure, bridges were sometimes prone to cracking along the bridge pins at the top. The solution then is to cap the bridge by gluing another piece of wood perpendicular to the grain. Capped bridges: A cap is a thin covering at the top of the bridge that adds structural integrity. This has become commonplace in manufacturing today. 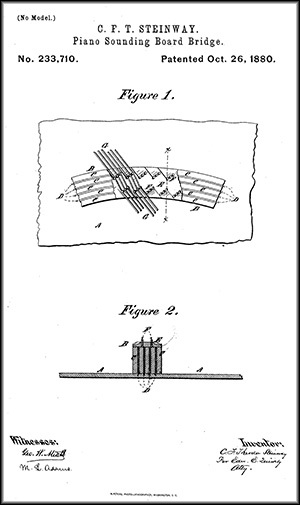 Vertically Laminated: Patented in 1880 by Theodore Steinway (US Patent #233710A), he explains how he vertically laminated bridges to make use of both hard and soft woods – hard woods like maple to withstand the pressure and soft woods to transfer tone. 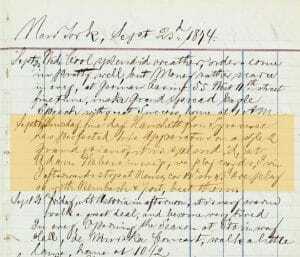 In essence, he patented a perfect solution to an age old problem – dense wood versus soft wood. And in doing so, Theodore Steinway explains that the soundboard is more “energetically propagated”. Vertical laminations are a significant step in bridge design and have been used extensively since then. Horizontal Laminations: While they might sound the same, horizontal and vertical laminations are incredibly different. While vertically laminations are labour intensive and made for ultimate transference of sound, horizontally laminated bridges are completely made for cost savings. It is my experience that horizontally laminated bridges inhibit sound transference and I believe there will never be a high grade piano built with a horizontally layered bridge because the sound simply cannot travel effectively through layers of glue and wood. If the sound transference runs from the strings down to the soundboard, it needs to travel through every layer of wood and glue. More layers means more inhibited sound. If you examine a piano bridge, the shape is very odd. Why is that? It’s to maximize the string vibration nodes for each note (see last month’s article on string vibration). If the bridge is not accurately placed, you’ll hear the difference. Similar again to the microphone analogy, you want to maximize the pickup for transference of tone. Bridge shape is critical and proprietary for each model of piano from every maker. Along with the placement of the bridge comes something called a cantilever bridge. 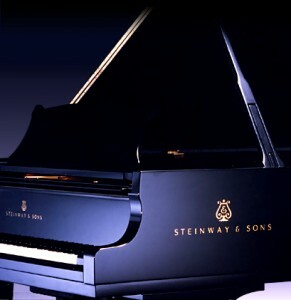 For the biggest, richest sounding piano, it is ideal to have long piano strings. One would think that having the bridge placed to the farthest edge of the piano would make for the longest strings possible. While this is absolutely true, the closer you get to rim, the less vibration occurs in the soundboard. Compare the piano soundboard to a drum or a diving board. 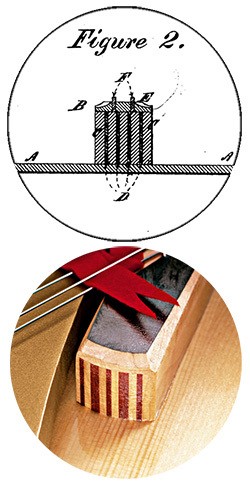 If the soundboard of the piano is a big drum, the closer to the center is where the maximum vibration occurs. A diving board doesn’t flex near the base. It flexes the further away you are from the edge. The problem is that the soundboard needs center vibration but the strings require length, placing the bridge closer to the rim. The solutions are 2 fold: one is to create a cantilever bridge which has the attachment point of the soundboard closer to center but the string contact nearer to the edge. The other solution is to “float” the soundboard so that the soundboard is unattached near the bridge. You can read more about floating soundboards in our interview with Del Fandrich. While most pianos have cantilever bass bridges, there is more interest as of late in floating soundboards. If you look straight down on a piano bridge, you can see the black top surface is shaped in a sort of zig zag. (The black is graphite paint which allows the strings to smoothly move across the contact area). The zig zag is present because the wood around the bridge pins has been carefully cut away. It’s a process called “notching”. If you look closely, you’ll notice that the treble strings are aligned in sets of 3. That’s because 3 strings make up 1 note on the piano. 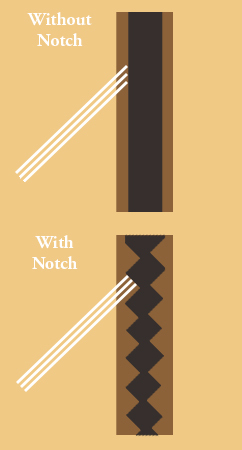 If the notch were not present in the bridge, the strings would have different lengths. To create a perfect unison, the wood must be chiselled away, also called notching. Inexpensive pianos sometimes have no notch at all. In some assembly lines, bridges are cut away by machine. 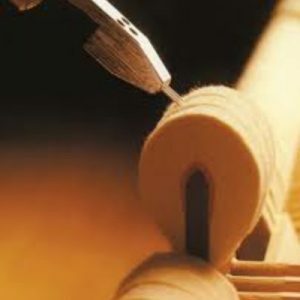 Ideally, a craftsman with a sharp chisel hand notches the piano bridge. When researching pianos, bridges are part of the continuum of sound. It is the conduit through which all string vibration must pass through. Subsequently, it has this incredibly important role and yet it is so often overlooked. Its dimensions, placement and even how it is attached to the soundboard all play vital roles in the amplification of piano tone. When bridges are working perfectly, they deliver lovely piano tone. They become invisible just like the microphone analogy. 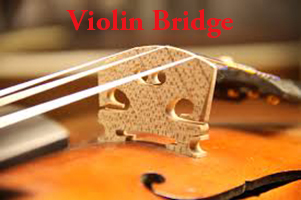 But when there are bridge problems, most often it results in lack of sustain or a choked tone. To confuse things, lack of sustain also can come from the hammers, the soundboard, poor design or poor materials. As a consumer, what do you look for in piano bridges? Good, better, best: Horizontally laminated bridges are adequate for cost effective measures but better designs are solid or capped. The ultimate balance between strength and mass comes either in the form of mass reduced (cut outs) or the vertically laminated bridges where light weight spruce is mixed with strength of the maple stripes. Bevels, cut-outs and notches are all part of enhancing the bridge for optimal tone. 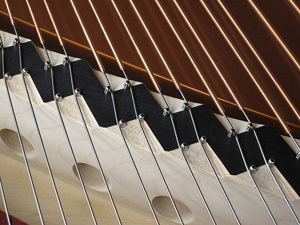 Bevels at the base of the bridge reduce contact on the soundboard and minimize energy loss. Cut-outs also reduce mass and result in more transfer of energy. The notches should, in my opinion always be present without which, individual notes do not have unison string length. When shopping for a piano, it is important to examine closely these seemingly insignificant details. As they say, the devil is in the details. Each link in the chain of piano tone must work collectively to create wonderful sound. Crossing the bridge is the funnel between strings and soundboard. It’s an area worth careful consideration.